Last Friday, February 25th all Israeli newspapers lead with events in Libya. Maariv, lead story, provides readers with an eye-witness account of events on the streets of al-Baida, while Israel Hayom headlines a comment by the White House, which says that the Obama administration has refused to rule out military action against the regime of Mu‘ammar Qadhafi. Yedioth Ahronoth and Haaretz both lead with what they call new evidence of the massacre of civilians that the Libyan regime is accused of perpetrating. Israel’s reaction to Wednesday night’s Grad rocket attack on Be’er Sheva continues to make headlines. According to reports in all the papers, the IDF has carried out several attacks on the Gaza Strip, with the latest on Thursday evening. Military sources say vehicles used by terrorists were targeted in Rafah in the Southern Gaza Strip. Palestinian sources reported that one person was killed and three others wounded. On the diplomatic front, Israel Hayom reports that representatives of the International Quartet for the Middle East said on Thursday that they hope to resume the negotiations between Israel and the Palestinian Authority. Robert Serry, the United Nations Special Coordinator for the Middle East Peace Process, said in a statement that the Quartet representatives suggested that separate meetings be held with the negotiating teams of both Israel and the PA. During those meetings the core issues will be discussed, including negotiations on the borders of a Palestinian state, the question of the Arab refugees and the status of Jerusalem. ‘We are waiting for confirmation from both sides that they are willing to meet with the Quartet envoys in Brussels next week,’ said Serry. Haaretz, meanwhile, reports on a crisis between Prime Minister Binyamin Netanyahu and German Chancellor Angela Merkel. According to the report, Merkel told Netanyahu during a telephone call this week that he had disappointed her and had done nothing to advance peace. The prime minister tried to persuade Merkel that he was about to launch a diplomatic initiative, explaining he is making a speech in two weeks in which he will outline a new peace plan. The German chancellor and her advisers, who have been repeatedly disappointed by Netanyahu's inaccurate statements and failure to keep promises, did not believe a word of what the prime minister told her, the source told Haaretz. And finally, settler-run news service Arutz 7 quotes an interview published Thursday with Wassel abu Yousef, a member of the PLO Executive Committee, who says that the Egyptian effort to mediate between Hamas and Fateh has resumed. Abu Yousef said that senior Egyptian intelligence officer Muhammad Ibrahim will meet the Palestinian Authority senior leadership next week, and will also confer with leaders of other ‘streams and national forces’ in order to end the rift within the PA. In an interview with Arab news agency Quds.net, Abu Yousef said Muhammad Ibrahim's visit to the PA signals that Egypt has gone back to its role in sponsoring reconciliation between Hamas and Fateh. Ibrahim may arrive in Ramallah on Monday, said the PLO official, and is expected to call for a large meeting of the PA factions. And finally it has been announced that Amr Moussa intends to run for the Egyptian presidency later this year when elections takes place. Moussa is well respected and positioned to win. 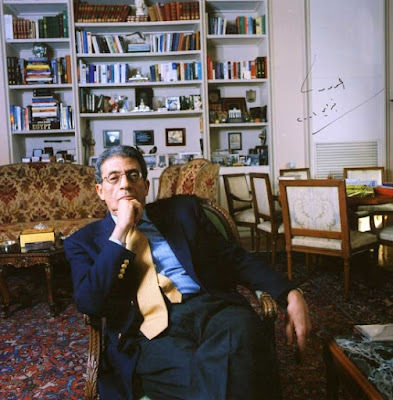 He's known for his straight-talk and toughness towards Israel when he was Foreign Minister of Egypt.